(July 17, 2013) COLUMBUS, OH—The Providence Glen community in northeast Columbus today announced the extension of their crowdsourced fundraiser benefitting an acclaimed local summer reading series. They aim to raise $3,800 on Indiegogo.com before August 7. The campaign to save the literacy program has combined traditional and modern approaches to raising funds. In June, Praxia Partners, a sustainable development firm, donated half of the budget shortfall in order to keep the doors open. Then, a coalition of organizations—ranging from local businesses to faith-based nonprofits, such as Dayspring Christian Community Development Corporation—came together to raise the other half. Over $1,300 was donated during the initial round of crowdfunding. Fundraising drives were once limited to an organization’s neighborhood. Thanks to the internet, however, Providence Glen’s literacy series has amassed support from all over Ohio, the nation, and even the UK and Kenya. Social media spreads the word, and crowdfunding allows individuals across the globe to support causes they believe in with just a click. 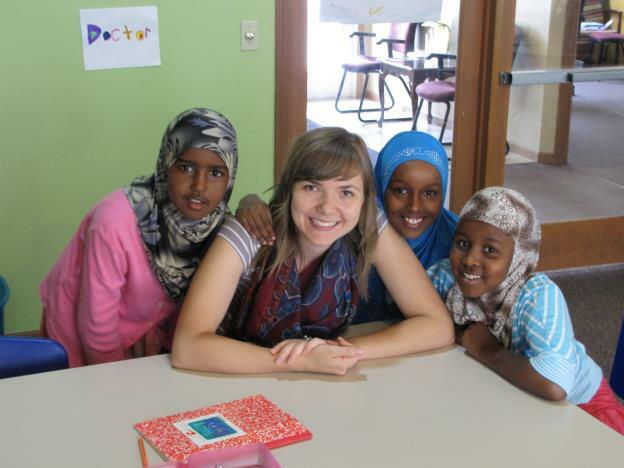 Children who participate in the ESL Afterschool Communities program are in the second through fifth grade and belong to Somali refugee and immigrant families. The reading series prepares them for the upcoming school year by combating “summer slide,” the learning loss that occurs over the long break. In the 2012 summer program, 100% of students maintained or increased their reading level. “It is so important for the children of this community to have engaging and safe activities to do during the summer,” said Brianne Manczak, educator and program coordinator at Providence Glen. To contribute, find “Summer Literacy at Providence Glen” on Indiegogo.com before Wednesday, August 7. Organizations interested in sponsorship should contact Laura Recchie at laura@praxia-partners.com. ESL Afterschool Communities (ESLAsC) is an acclaimed outreach initiative of Columbus State Community College’s Center for Workforce Development, serving the city’s large immigrant and refugee population. Since 2005, the community-based initiative at Providence Glen has boosted students’ academic, social, and personal development over the summer and throughout the school year. For more information, visit www.cscc.edu/workforce/eslas. Dayspring Christian Community Development Corporation was established as the community development extension of Rhema Christian Center in order to provide affordable housing to low and moderate income households and to promote economic self-sufficiency. To learn more, visit www.rhemachristiancenter.com/dayspring. Praxia Partners was founded by Joe Recchie to advance sustainable community and economic development. Through its Bridge Program, Praxia Partners seeks to buoy organizations and programs that promote community-building. To learn more, visit www.praxia-partners.com.